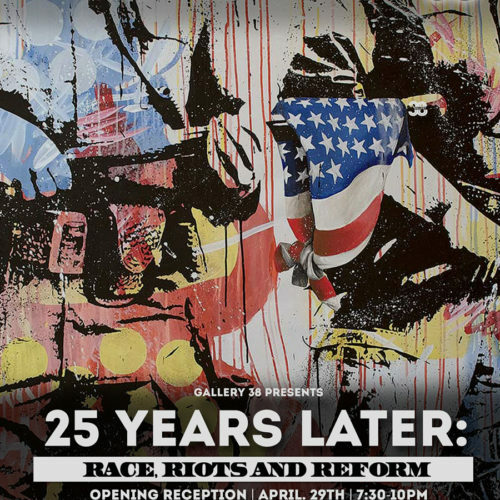 Gallery 38 is pleased to present 25 Years Later: Race, Riots and Reform a group exhibition, featuring the artwork and artifacts of artists and educators who lived and worked during the 1992 Los Angeles Riots. April 29th, 1992 was a day enshrined in our memory with events that led to a temporary unraveling of social normalcy through the lens of race, rioting and economic and reform due to the verdict of Los Angeles motorist Rodney King. How does presentation of media coverage help to shape the perception vs the reality of an incident? The footage of King being beaten by police while lying on the ground became an instant focus of media attention and a rallying point for activists in Los Angeles and around the United States. 25 Years Later: Race, Riots and Reform uses a survey of ideas, memories and documentation to start a conversation on how social inconsistencies play a part in shaping our communities locally and nationally. Through housing discrimination, prejudice and police brutality, Los Angeles has been a hotbed of tension since before the Watts Riots of the 60’s and continues today. The City of Los Angeles has made advancement in reforming policies that have healed a few wounds but still have guidelines in place that affect the everyday Angelino, potentially assisting to a rise in racial and economic anxiety leading to eruption within the urban metropolis. Featured Artists: James Dupree, Moncho 1929, Sharon Barnes, AiseBorn, J.Michael Walker, Larry Johnson, Gabe Tiberino, Sei Shimura, Vanessa Rivera, Bryan Lee Tilford, Michael Luckey.